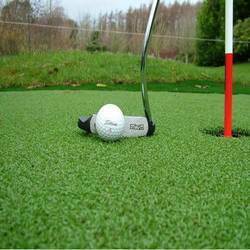 Prominent & Leading Manufacturer from Mumbai, we offer artificial grass for golf court. We offer Artificial Grass for Golf Court which is replacement for natural grass. Natural grass suffers from intensive use and weather plus maintaining a natural golf course is quite expensive. By using Artificial grass for golf course in place of natural grases, there will be no maintenance cost. Artificial grass for golf is player friendly, durable, low at maintenance, weather resistant and economical. Artificial grass looks natural and gives realistic feeling. Artificial grass for golf can be used for both indoor and outdoor applications like grounds or rooftops. Artificial grass is made by combining separate synthetic grass fibers. Artificial Grass for Golf is available for various areas in a golf course such as driving ranges, fairways and golf putting greens. Our artificial grass for golf has extreme long life even with constant usage. We believe in quality and we deliver artificial grass for golf that is performance efficient and reliable. We offer our Artificial Grass for Golf in competitive rates in the market.